From Childhood Fun to Lifelong Addiction: Advertising Signs, Vintage Signs, Americana Vintage Signs, Antique Signs, Vintage Neon Clocks, Old Signs tell many things about my long journey. It all started way back in the early 1970’s. During those time, out of fun, I started collecting advertising signs, Old signs blog, and vintage neon clocks. Soon that habit of collecting signs turned out to be my lifelong addiction. I still remember the first piece I purchased. It was a Coca-Cola stained glass hanging lamp. However, the original version was years old, but the Coca-Cola reproduced those signs during the 1970’s. That was the beginning and the very first step towards my vintage collection career. Moreover, In the following years, I purchased several other advertising pieces and Old signs blog and added them to my collection. I was addicted to Neon Signs during my early days. Our interest in Oil and Gas sector reached the peak when I started working in the oil field in Caspar Wyoming. We started building our collection in the 1970’s and purchased oil and drilling company stickers, signs, Old signs blog and hats. However, it took me almost 10 years to buy my first neon Coca-Cola clock. But my tradition and addiction with neon exist even today. Meanwhile, we have various Vintage signs, old signs blog, antique signs, vintage old original neon clocks for sale in our store right now. Neon Clocks were a great piece of Art. During my early days, I was surviving on two jobs and had a living place on the 18th floor of a high rise building. It was then when I purchased the first neon Coca-Cola clock. I am talking about the 1980’s, and after the first purchase, my excitement grew. Not to mention, I then had a feeling that I will be a sound collector for life. While everyone was falling in love, I had a different love story altogether. I was also in love, but with neon and Old signs blog. Furthermore, those clocks were fully functional. Apart from time, it was a great piece of art. So beautiful, that sometimes you will look at the clock for a quick time but end up mesmerized by the art. Our collection has massive Neon Clocks of various Sizes and Brands. You will forget that this unique and beautiful piece of art tells time as well. During those time, I was so much fascinated by those functional clocks that I started searching for various other brands available. In the first place, I used to call the antique stores taking numbers from the yellow pages. The first thing I used to ask was- You have neon clocks? And their response used to be- Neon what? It took me some time to adjust with the availability of the neon signs and Old signs blog in the market. Finally, in the end, I found an old Gas Station clock, but that was not functional. Restoration of Antique clocks: Second Inning of my love towards Neon clocks. With very fewer resources available, I soon realized that restoration has something for me. I jumped into the restoration business. I started purchasing dead clocks and bringing them back to life by providing necessary restoration. However, still, there was very less to do in clock field. So, I had to make a turn towards the vintage signs and Old signs blog. There was a burning desire inside me for neon clocks. Within a few months, I filled my flat with various signs like Cutter, the Mobil, etc. It was hard to face those embarrassing faces when I used to take those big signs inside the lift. With passing years, we moved to a bigger house in the town. That house lasted with us for nearly ten years. It had a large storage unit, and everything was filled with my collectible vintage signs and old antique signs. Not to mention, many signs were stored in the basement due to lack of proper space. Apart from the signs that we have discussed above, we have many more in the stores. Like Plastic, Wood, Porcelain, Tin, Masonite, Vintage signs, old signs blog and advertising signs. In the subsequent blogs, we have tried sharing things like- the Best way to clean Porcelain signs and much more. Also, our store is full of wonderful signs. You plan to purchase one sign, but as soon as you go through my whole collection, your mind changes and you feel like taking everything with you. You can get to know various historical facts about the signs and Old signs blog available to me. 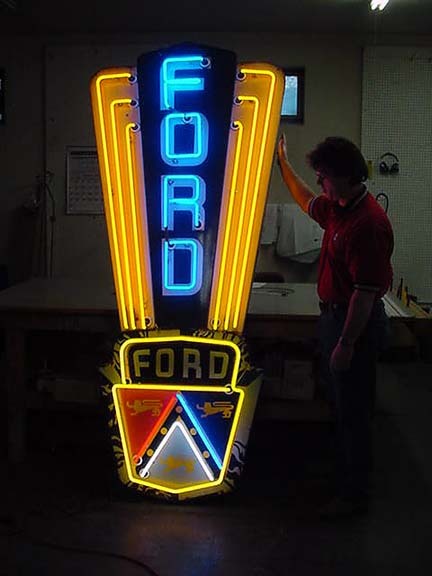 As a matter of fact, we make sure to verify the history of the signs and vintage neon signs before purchasing. Moreover, our collection comprises neon clocks from the 1950’s. But never bother about its functionality. Being a restoration manager, I personally mend every clock before putting them in the display for further trade.